An ailing king lives at the heart of the Wasteland. We often find this figure in fairy tales, such as “The Water of Life,” where efforts to heal him launch the story. Jungians interpret the king as the “dominant ruling attitude” of a culture or individual, which grows atrophied unless it is periodically renewed. In the earliest versions of the legend, the king is healed when the hero asks this question: “Who does the Grail serve?” In these tellings, the Grail is a stone or a large platter that nourishes each person according to their heart’s desire. This suggests a cornucopia, a potential earthly and spiritual abundance. There have always been cycles of growth and cycles of famine, cultural florescence and decay. In the legend, that question, “Who does the Grail serve?” appears to lie near the heart of these cycles. Somehow we intuit that what Campbell termed “Greed for more than one’s share” on a large scale is a formula for disaster. In my two previous posts, I mentioned hearing many accounts of people seeking new ways of doing most everything. I’ve collected so many stories it took several days figure out how to present them. Simplicity won out in the end; here is one brief account, with more to follow in the future. I’ve listened to Jill Stein on several occasions, most recently on BillMoyers.com in November, 2013. 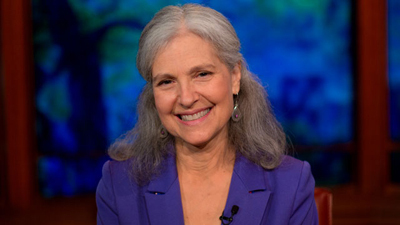 Stein, a Harvard Medical School graduate, “became so outraged by how politics adversely affected her patients” that she ran as the Green Party candidate for president in 2012. I encourage everyone to watch the interview or read the transcript. There much that was frightening but even more that was hopeful in this discussion of our current situation. As time goes on, I’ll feature other optimistic stories I have collected, featuring “ordinary” people searching for those Grails that can transform and renew the world and the lives we are living. This entry was posted in Article, Folklore, Myth, News, Politics and tagged folklore, Jill Stein, Myth, politics, The Grail, The Wasteland. Bookmark the permalink. Thanks for these posts, Morgan! You’re welcome! The subject is just so huge, however – think of the number of books people have written – that it’s hard to do more than hint in just a few posts. I believe that you could do the subject justice.! I probably will try, but by breaking down the various topics a little more. Like think how much there is to say on the subject of just “water” alone!